Many researchers and clinicians believe that stem cells will one day be used in regenerative medicines to treat many injuries and diseases, including Huntington’s disease (HD). Researchers think that nerve cells that die in HD patients may be able to be replaced with new healthy neurons made from stem cells. Scientists are already able to use stem cells to create nerve cells similar to those lost by HD patients. However, researchers from Cardiff University say that repairing a HD patient’s brain will likely require more than just replacing one type of nerve cell. Reddington and colleagues present evidence in their 2014 review in the journal Frontiers in Cellular Neuroscience indicating that treating a HD patient will necessitate implanting many types of cells. These various cells, in the right combination, will most likely needed to successfully incorporate the new neurons with neurons still in the brain of a HD patient. Many researchers want to avoid the moral and ethical issues of taking cells from a foetus. Aside from the ethical issues, there are also many technical reasons why using cells from a foetus is not a viable method for treating HD patients (such as quality control and the number of cells needed for a single treatment). This is why many researchers are attempting to use pluripotent stem cells to make the ‘medium spiny neurons’ that HD patients need. Particular stem cells, called ‘induced pluripotent stem cells,’ are created from cells taken from a patient, such as skin cells. This helps to avoid some moral issues. Researchers have tried using stem-cell-derived neurons, but many of these studies show that stem-cell-derived neurons do not integrate into the existing brain cells as well as cells transplanted from a foetus brain do. What does this mean for people affected by Huntingdon's Disease? The not-so-good news: A viable treatment for HD still looks to be a long time off. Using stem cells to treat HD disease is going to be complicated because a range of cells are likely required for successful brain cell transplants in patients. Stem cells offer numerous advantages and avoid many ethical issues, but they also have their own complications. Researchers first must learn how to control stem cells to reliably make specific types of neurons and other cells. This takes years and lots of work. Once a procedure is known, it still takes weeks or even months to make some types of cells. It’s lots of labour, time and money. Although there are a huge number of issues to overcome to make a treatment possible for HD disease, remember that science is quickly moving forward. Yes, there’s lots of work to be done, but discoveries are made every day and research is getting faster. Ultimately, it’s just a matter of time. HDBuzz is a well written website that has summaries research articles about Huntingdon's Disease written in plain language. This summary is based on the original article ‘Differentiation of pluripotent stem cells into striatal projection neurons: a pure MSN fate may not be sufficient’ by Amy E. Reddington et al., Frontiers in Cellular Neuroscience 2014. A journal subscription may be required for access. A great source of on-going information on using pluripotent stem cells to treat Huntington’s disease can be found at Repair-HD. This website provides the public information on a four-year collaborative research project funded by the European Union’s Seventh Framework Programme for research. Another research funded project focused on using stem cells to repair the human brain is the NeuroStemCell Repair Consortium. Wikipedia offers a description of the huntingtin gene and protein mentioned in this article. Please note that these are rather technical descriptions. Written by Dr. Ryan Lewis, edited by Dr. Jan Barfoot, reviewed by Dr. Anne Rosser. The ‘striatum’ is a part of the brain important for associating emotions with people and things around us, it is shown in red in the image above. Two examples of this would be knowing that we love a person when we see his or her face and recalling memories and emotions associated with a specific smell or song. The striatum is also important for coordinating signals to our muscles that allow us to make smooth and controlled movements. Symptoms associated with Huntington’s disease are caused by the death of neurons in a patient’s brain. 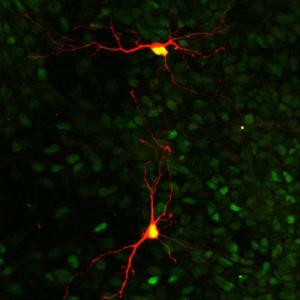 ‘Medium spiny neurons’, shown here in orange, are the primary type of neurons that die from the disease. Medium spiny neurons are found in the part of the brain called the ‘striatum’, which is important for emotions, motivation and movement.